From left: the Olive Egger, the Black French Copper Marans and the Dominique. With temperatures above 50 degrees today, we decided to take the chicks on a field trip to see their chicken coop! I packed all three into a cat carrier, and walked them out into the yard. At first they were scared to come out of the carrier, but the bold Olive Egger led the way. 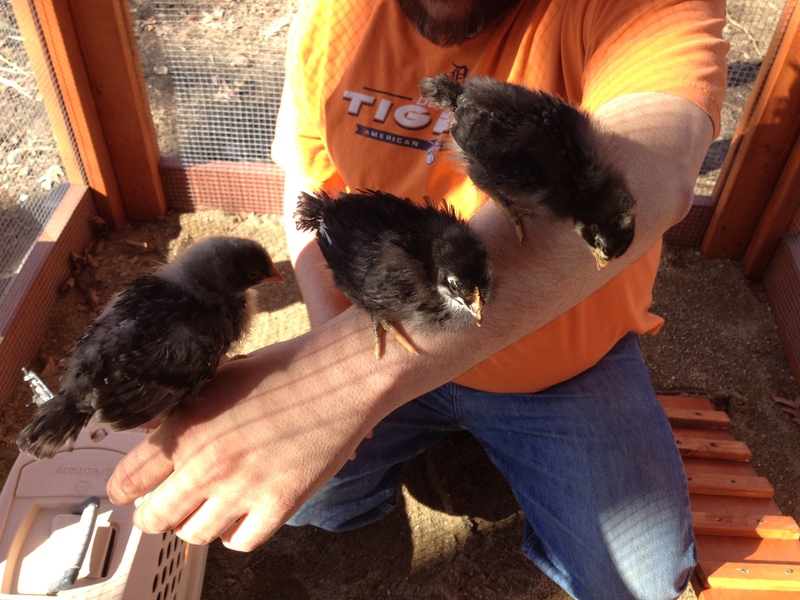 Before we knew it, all three were chirping, and picking at grit for the first time. At one point Matt had all three balanced on his arm. This marked a major milestone in terms of the chickens trusting us humans. Most often they will run from our pesky hands. But today they seemed to open up, welcoming us into their world. We were outside maybe 10 minutes, but it was enough to show them their news digs, and to experience sand for the first time. I know they loved it. Each one christened the coop, if ya know what I mean. The Olive Egger checks out the recently installed ramp in the run. We also readjusted a pesky sliding latch on the hen house door that was almost impossible to open. Now it slides back and forth, like butter. The highlight of the day was installing a pulley system to make the guillotine chicken door operable. The little door will allow the chicken to move from the hen house, down a ramp and into the run. Matt installed a series of eyehooks in the ceiling of the hen house, then ran a thin rope from the guillotine door, through the eyehooks out to the front of the coop. All I will have to do is pull on the rope, attach it to a hook … and voila! The door will stay open. To mark the occasion, here’s a very short video showing how it works! Thanks so much for your kind words, Peep-Chicken! We are just starting to think about names for the babies. 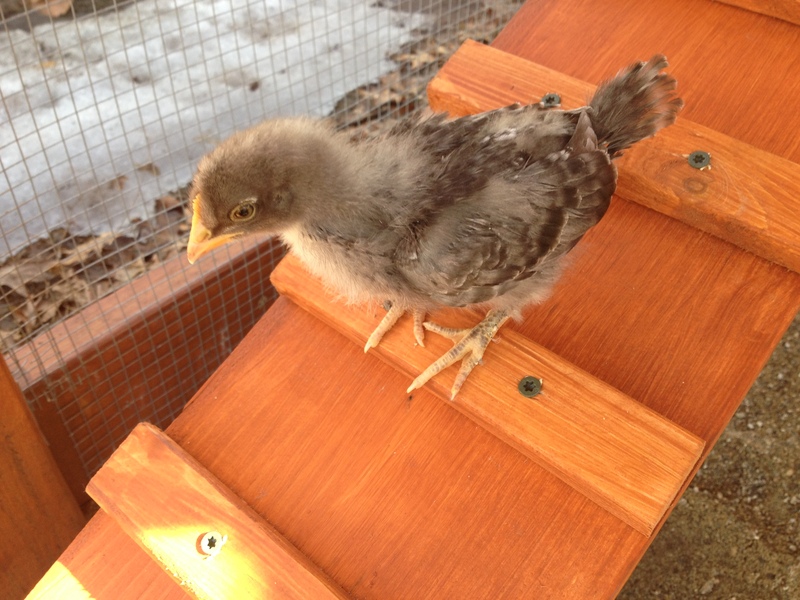 I think I’m going to call the Olive Egger, Gigi (actually GG for Gentle Giant). We should have names for all three this week, I’m hoping! Your babies are so cute! Good luck.